Bermuda is celebrating National Heroes Day today [June 19], honouring those who have made “significant positive contributions to the growth and development of society,” with Bermuda’s National Heroes including Dame Lois Browne-Evans, Dr. E.F. Gordon, Dr. Pauulu Kamarakafego, Sir Henry Tucker, Mary Prince, Gladys Morrell, Sir E.T. Richards, and Sir John Swan. “A National Hero is someone who beyond that has made significant positive contributions to the growth and development of society, and represents all of us,” the Department of Community & Cultural Affairs said. 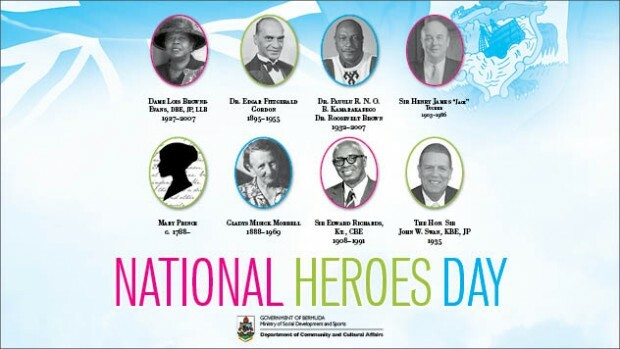 “To know our heroes is to know ourselves: our values, our collective history, who we are, and what makes us as Bermudians great. Acknowledging our heroes is an acknowledgement of who we are – of our history, heritage, and culture. “National Heroes Day is celebrated each year on the third Monday in June. 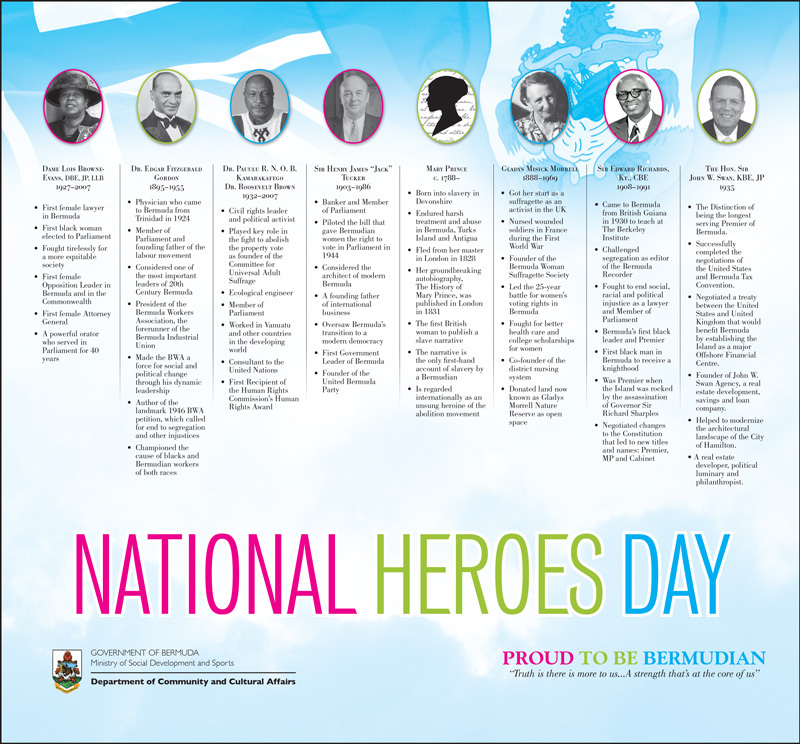 The purpose is to honour those persons who have been officially designated as National Heroes in Bermuda. The information below is courtesy of the Department of Community & Cultural Affairs. The Distinction of being the longest serving Premier of Bermuda. Successfully completed the negotiations of the United States and Bermuda Tax Convention. Negotiated a treaty between the United States and United Kingdom that would benefit Bermuda by establishing the Island as a major Offshore Financial Centre. Founder of John W. Swan Agency, a real estate development, savings and loan company. Helped to modernize the architectural landscape of the City of Hamilton. A real estate developer, political luminary and philanthropist. I guess its who you ask that is a Hero. I guess all de Heroes for Civil Rights are already named. In its 400-year history, most of Bermuda’s heroes are former politicians from the last 50 years. Isn’t that amazing?!? This holiday is simply a politician-invented excuse for politicians to tell us how great politicians are. Why don’t we just call it “Summer Holiday” or “Carnival Day” and forget politicized hero-naming? Or call it “Constitution Day” to celebrate the first democratic constitution?